Distributor Park Circus said that the 1946 Rita Hayworth film “Gilda”, in which she performed the hit song “Put The Blame On Mame”, will screen at the BFI as an all-new Digital Cinema Presentation that showcases Rudolph Maté’s fabled black-and-white cinematography. Directed by Charles Vidor and co-starring Glenn Ford, the gangster picture was Hayworth’s signature role and a poster of the actress from that period was a key artefact in the popular 1994 Stephen King prison drama “The Shawshank Redemption”. “Gilda” will open at BFI Southbank in London, Filmhouse Edinburgh, and the Irish Film Institute and in key cities on July 22. 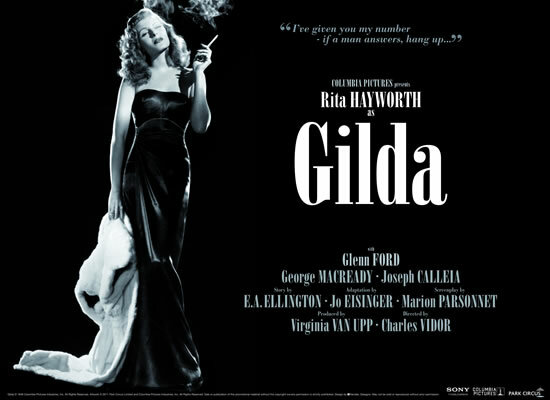 This entry was posted in Film, News and tagged 'Gilda', Glenn Ford, Park Circus, Rita Hayworth. Bookmark the permalink.